They went to the Capitol to protest cuts to their health care. Instead of being heard, they were dragged out and arrested. 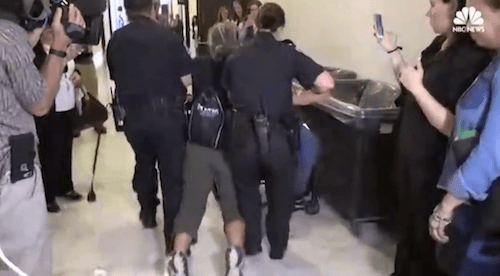 Nothing shows the utter cruelty of the Republican plan to destroy health care like the images of patients dragged from their wheelchairs and arrested by Capitol Police, just for protesting this horrible bill. The pictures and videos that emerged from the protest outside Senate Majority Leader Mitch McConnell's office were shocking and sickening. Disabled patients who rely on Medicaid for their essential and life-saving care hoped that they might find some compassion and mercy from the Republicans intent on gutting their health care. As the ACLU put it, "We can't believe this needs to be said, but it's not okay to drag people out of wheelchairs when they're protesting legislation." ADAPT, the 25-year-old disability rights organization that organized the protest, immediately created a page on GoFundMe to raise money for the legal fees these patients now face. As of Friday afternoon, the group had exceeded its goal and raised more than $14,000. It should go without saying that such a fundraiser should not have been necessary in the first place. And that these Americans whose lives could be destroyed if this bill is passed into law should not have to beg for mercy from their elected officials — only to find themselves arrested. As The New York Times reported, one in five Americans depend on Medicaid for their health care. It's an especially critical program for the elderly, for poor children, and for the disabled. And the Republican plan to slash Medicaid would be a disaster for millions of Americans. But Republicans aren't listening to those Americans. They crafted their bill in secret, without any input from their constituents, including the most vulnerable patients. McConnell refused to even meet with representatives of several advocacy organizations who opposed the bill, including the American Heart Association, the American Lung Association, the American Diabetes Association, and the March of Dimes. President Barack Obama blasted "the fundamental meanness at the core of this legislation" in a powerful statement on Facebook. And dragging patients from their wheelchairs and arresting them for protesting the cuts that could destroy their lives shows just how mean it really is.